Have you been looking for a beautiful vintage styled shoe, then oh boy do I have the video for you! Today I have for you a fabulous video on Charlie Stone Shoes, sharing a little about the company, talking about their new VEGAN shoes and giving my review and thoughts on their Roma shoe style! If you own your own pair of Charlie Stone I’d love to hear your own feedback, and please post links to your instagram looks showing how you’ve styled your look with these beautiful shoes! I post videos every Tuesday, Thursday and Saturday so be sure to subscribe to never miss a video! Email contact@ladylace.com.au for sponsorship and collaboration details. 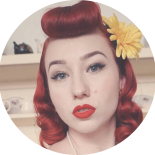 This entry was posted on December 22, 2018 by Miss Lady Lace in Pinup, Reviews, Videos, YouTube and tagged 1940's, 1950's, blogger, Charlie Stone Shoes, glamour, miss lady lace, miss lady laces pinup blog, perth, perth pinup, perth pinup blog, perth pinup community, pin up, pinup, pinup blog, pinup blogger, pinup fashion, pinup girl, pinup life, pinup lifestyle, pinup perth, red lips, retro blog, retro girl, retro glamour, the perth pinup community, victory rolls, vintage, vintage blog, vintage blogger, vintage fashion, vintage girl, vintage glamour, vintage perth, vintage pinup blog.